Reality Check: Who’s buying the Putin calendar? 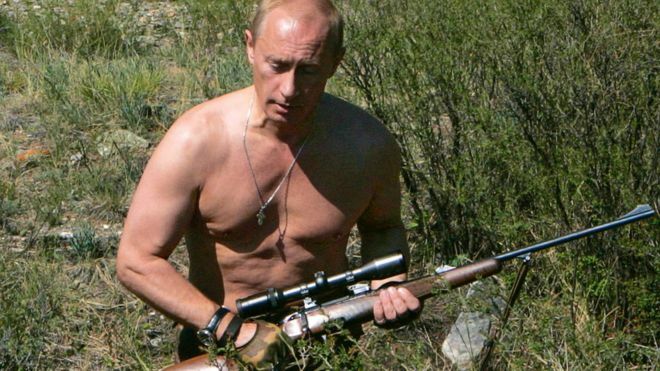 The claim: Copies of a Vladimir Putin calendar have been “selling like hot cakes” in the UK. Reality Check verdict: We’ve been unable to find any shop in the UK stocking the calendar, while sales online have been limited. 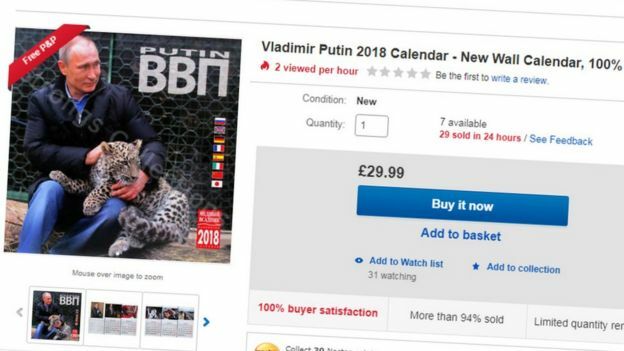 Some media outlets in Russia are claiming that a 2018 calendar showing President Vladimir Putin in various poses “sold out in a few hours” when it was put on sale in the United Kingdom. The website of Russian newspaper Izvestia claims the Vladimir Putin calendars are “suddenly fashionable” in the UK. “There are no calendars anymore. They were all bought out in just a few hours,” it says. The state-run RIA news agency says the calendar has “caused great excitement among local residents”. 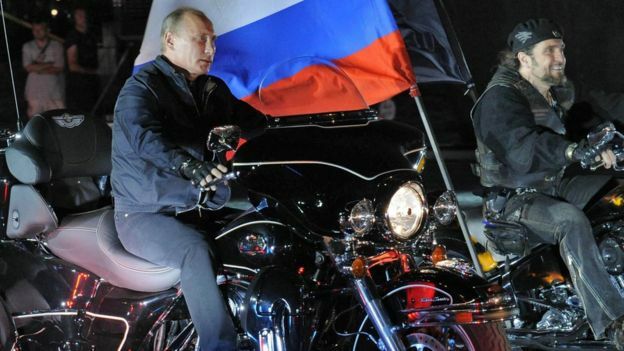 Image captionMr June revs up to relive the time Mr Putin joined the Night Wolves’ motorbike festival in Novorossysk. Moscow’s TV5 said the calendar was “selling like hot cakes in Great Britain, where it became popular with buyers almost immediately”, but it did state that only the online vendors were calling it a bestseller. “Reviewers of the merchandise are in awe of the Russian president’s way of life and suggest that buyers share the positive emotions,” one newsreader said. But are British shoppers rushing out to celebrate Russia’s hunting, shooting and judo-fighting leader? Or is it – as one Russian blogger put it – “fake news”? The Vladimir Putin calendar certainly enjoyed some solid British media coverage last month, appearing in the Sun, the Daily Mirror and the Daily Mail. But the stories are hardly full of praise. 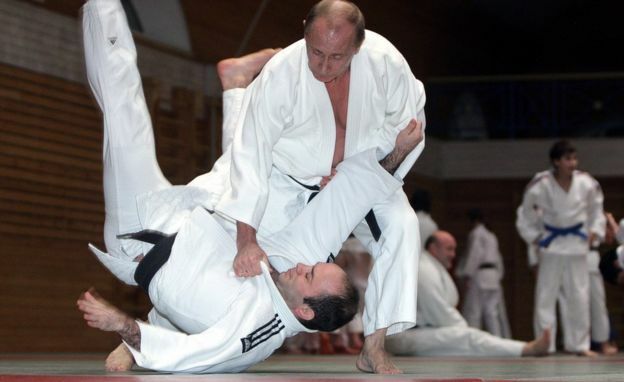 The Daily Star branded the series of photos “hilarious” and called the Russian leader “Vladimir Poutin'”. None of the features in the British press makes any claims about how well the calendar is selling. We contacted 10 of the UK’s biggest sellers of calendars – none of them is stocking the calendar. The calendar is, however, available from various vendors on eBay and Amazon – none based in the UK. Prices range from £8-£72 (postage included). The largest seller is based in Voronezh, Russia. Between them, the vendors have sold a few hundred copies – and we don’t know if all of those customers were from the UK. To put that in context, UK retailer Calendar Club expects to sell about four million calendars this year. Most of the Russian coverage homes in on a report on the 360TV news website. Headlined with the very definitive “The British bought all the calendars with pictures of Putin on the hunt”, it cites the Daily Mirror as the source for its claim. The Mirror’s report makes no such statement, but does note the calendar is limited to 6,000 copies, available through the seller’s eBay store. Russian blogger Noodle Remover was among the first to notice that Russian coverage of the same story may have embellished the facts, citing a tweet by journalist Alexey Kovalev. “We really have to do something with this mass inferiority complex,” the tweet says. “You can’t want praise from foreigners so desperately and make it up if you’re not praised. “In the original article, there’s not a single word about [the calendar being] ‘swept off the shelves’ and ‘standing in the queues through the night’, it is an invention of the ‘vatnie’ [pro-Kremlin] cotton-woollen chroniclers,” Kovalev writes. The calendar appears to be the work of a printing house in St Petersburg. It’s not known if it comes with the official seal of approval. Some of the pictures are at least 10 years old. Come on and Trump that!